SAVANNAH, Ga. -- Advocates accused a Georgia lawmaker of targeting Muslim women with proposed changes to a 1951 state law passed to unmask the Ku Klux Klan, creating a backlash that prompted the Republican legislator to quickly discard the idea. State Rep. Jason Spencer came under fire from the American Civil Liberties Union and Muslim advocacy groups who called his proposal a veiled attempt to ban Muslim women from wearing scarves and other religious headgear that covers their faces in public - just as the law has prohibited Klan members from wearing masks during rallies and marches on public property. 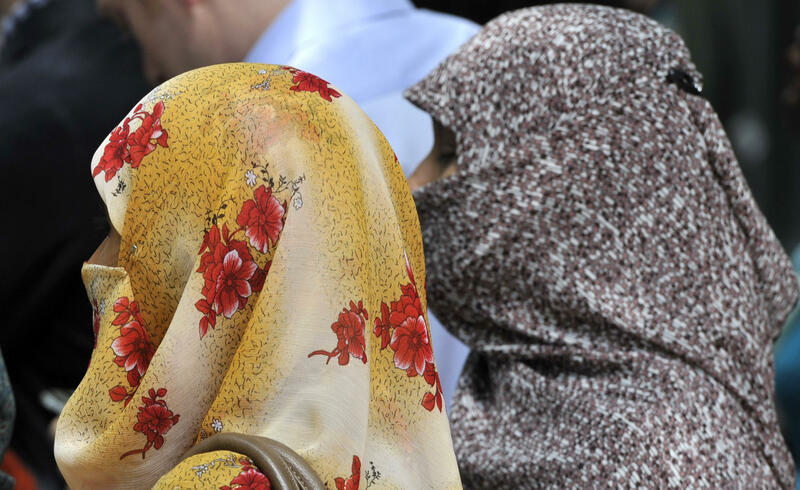 “It is a naked and despicable attempt to exploit the current wave of anti-Muslim sentiment by targeting Muslim women,” Heather Weaver, an attorney for the American Civil Liberties Union in Washington, said Thursday. Spencer said the bill he introduced for next year’s session of the Georgia Legislature would simply be “adding clarity” to a law passed decades ago to safeguard against what he called “threats from masked terrorists.” And he insisted he wasn’t targeting any specific group. But by Thursday evening Spencer announced in a statement posted on the Georgia House website that he was withdrawing his proposal “due to the visceral reaction it has created.” He confirmed the decision in an email to The Associated Press. One thing neither side mentioned amid the controversy: Georgia’s highest court has narrowly interpreted the 1951 law to apply only when one wears a mask to intimidate others. The proposal also would have banned people from wearing anything that conceals their faces in photographs used for Georgia driver’s licenses and other official state IDs - something the Georgia Department of Driver Services already prohibits. Known as the “Anti-Mask Act,” the original law was approved 65 years ago when masked Klansmen used threats and violence to intimidate blacks and other minority groups in Georgia. Supporters of the law argued masked hoods allowed Klan members to terrorize in anonymity. Victims of Klan violence could rarely identify their attackers for prosecution. That law has never been used to stop people from covering their heads or faces for religious reasons. And it doesn’t look like that would have been allowed even if Spencer’s bill became law. In 1990, the Georgia Supreme Court rejected a suing Klan member’s argument that the anti-mask law “criminalizes a substantial amount of innocent behavior” such as wearing a ski mask in the winter or wearing sunglasses. Under the court’s narrow interpretation, the lawmaker’s proposed changes wouldn’t apply to Muslim women “because they’re not wearing their gear to intimidate anybody,” said Michael Perry, a law professor at Emory University who specializes in constitutional law and religion. “The only effect there of adding ‘she’ is it makes clear what was already known - that the law applies to female Klan members as well as male Klan members,” Perry said. Spencer’s proposal to prohibit face-covering garb in driver’s license photos was essentially redundant. The Georgia Department of Driver Services allows people to wear religious headgear in their photos - but its rules say any headscarves or other coverings must be adjusted to make the entire face visible.